The Leonberger, a large breed of dogs, originated in Leonberg in Germany in 1846 and that is where it gets its name from. According to stories it was bred as a ‘symbolic dog’ which would imitate the lion in the town crest. Being an all-rounder, it was a favorite among the royalties. At the end of World War it almost came to an end but was revived by German breeders who were loyal to the breed. Leonberg is regarded as the oldest of all German breeds. It is used as a working breed and friend in Germany, France and Scandinavia whereas in the other countries it is difficult to obtain. The Leonberger breed is huge, strong and majestic with impressive and royal looks. It is strong, well-built and very dependable. It is referred to as a ‘gentle giant’ and is very loving, dedicated, devoted and reliable. It gets along with children and pets including dogs and if left alone for a long period of time then they start barking and may even become destructive. A devoted owner is necessary for this breed. It is important to note that even though the breed is quite gentle and self-assured, its maintenance is heavy. It needs brushing on a daily basis in order to remove dead hair and reduce shedding and bathing should only be done when needed. Regular cleaning o ears and dental hygiene is necessary. They are a double coated breed with the outer coat being lengthy, lavish and straight and the under coat being thick and compact. This breed sheds heavily with seasonal blowing of coat. Leonberger need daily exercise, family play sessions and stimulation and thus are not advisable for apartments. This breed is best for a rural environment or in a huge fenced ground. The Leonberger loves to swim, hike, run and play with family. 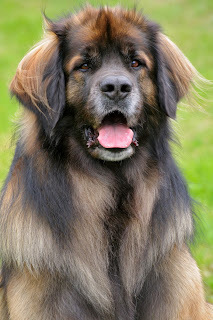 Leonberger have a sort lifespan and live for a period of only 8 to 9 years. They are at a risk of hip dysplasia, Addison’s disease, eye problems, bloating and hypothyroidism.